The design of the NIF laser, including the pulse shaping system, provides a great deal of flexibility in pulse length, pulse shape, and pulse energy. Energy limits for safe laser operation depend on the details of the pulse shape. The energy available for a specific pulse shape may be limited due to energy stored in the main amplifier slabs, intensity dependence of the frequency conversion, and potential damage to the 1w and 3w sections of the laser. Damage may occur due to fluence on optical surfaces or B-integral effects resulting in lamentation in the optics themselves. Optical damage, primarily of the wedged focus lens, is a factor in determining the maximum power and energy available at NIF. Each NIF beam has its own statistical distribution of intensities within its beam profile. This distribution varies with requested power, energy, and pulse shape. Consequently, the risk of optical damage varies from beam to beam and changes as more or less damage-resistant optics are installed. 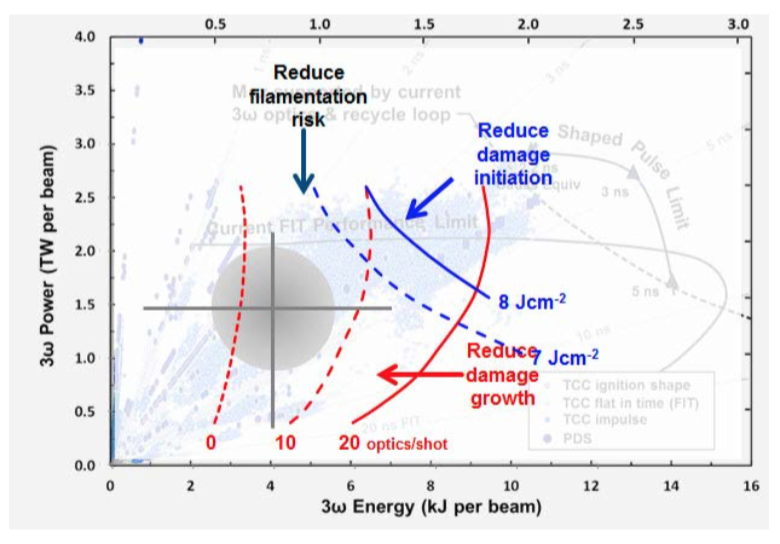 The NIF laser system is able to operate routinely above the damage initiation and growth limits because it utilizes the Optics Recycling Loop Strategy described in Section 4.10. Figure 4-5 shows the sustainable operational energy and power limitations overlaid on delivered pulse energy and corresponding power. Operating in the power/energy space defined by the grey circle shown in the figure minimizes the damage risk to the laser. Figure 4-5. NIF’s energy and power operational range. NIF laser performance limits are driven by optics damage and non-linear effects. For any given experiment, the user-requested energies and pulse shapes are submitted to the Laser Performance Operations Model (LPOM) to assess their feasibility. LPOM simulates the beam fluence and intensity of each participating beam at all relevant points in the laser and checks the results for compliance with NIF’s equipment protection limits. If any limit checks fail, NIF’s expert groups are available to work with the experimenter to modify the pulse shape or energy requests to protect the laser while continuing to meet experimental needs.